You can learn the best tummy exercises that work your stomach muscles on this site. This page shows you a challenging exercise on a bosu ball that can help to tone your stomach. 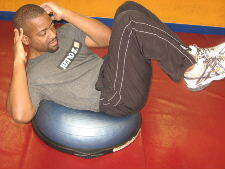 Your stomach muscles will work more on a bosu ball than the floor because it is unstable. In addition, the contour of the bosu ball increases the range of motion through the spine and this increases the muscle work in the stomach muscles. Form: Exhale and crunch your body up towards your knees. As you get to the top of the motion, twist your body to one side bringing your left elbow to your right knee. Hold for a brief second and then slowly lower to the starting position. Personal Trainer Tips: You can perform 5-12 reps on one side and then rest before going to the other side. Or you can alternate sides for 10-24 repetitions. It's okay to touch your feet down if you lose your balance. Just move back into the starting position and continue the set. But remember that best tummy exercises and tummy toning exercises are only a part of getting a smaller waist and trimming down your tummy. 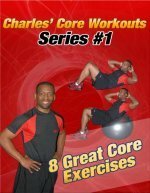 Learn more of the best tummy exercises by visiting the picture directory of stomach exercises.